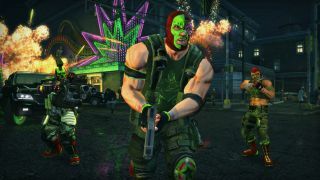 GOG has added some Saints Row, some Darksiders, and a Metro game to its lineup, all of them completely without the hassles and headaches we know (and really don't love) as digital rights management. And to mark the moment, it's got them all on sale, too. First up is Saints Row 2, now on for $4 instead of the regular $10 price, and Saints Row: The Third—The Full Package, which includes the main game and a pile of DLC, for $5 instead of $15. Then there's Darksiders, currently going for $8, and Darksiders II, which is $12. The Darksiders II Complete DLC pack is also up for grabs for $8. Finally, there's Metro: Last Light Redux, and this one strikes me as a bit odd, because Metro 2033 Redux is nowhere to be seen. Licensing issues are sometimes a problem with GOG releases, but Deep Silver hold the rights to the entire franchise, so if it can do one it should be able to do both. Technical issues, maybe? Whatever the case, Metro: Last Light Redux is on for $12.50, which I'd say is a really good price for a really good shooter. All five of the new-to-GOG games are available now, and will remain on sale until May 18. Update: The mystery of the missing Metro hasn't exactly been solved, but it has been acknowledged, and there's a chance the game will turn up at some point in the future. "We cannot say exactly why it’s been released this way, since this is related to discussions that are under NDA," a GOG rep explained. "But we sure hope that we will be able to bring Metro 2033 Redux to GOG in the future."